Who is greatest of them all? Sathya Lokaa, the abode of God Brahma and his consort Saraswathi Devi was unusually busy. Why shouldn’t it be so, when none other than the venerable sage Narada was visiting it? For a tri-loka-sanchaari who keeps wandering around the cosmos, the schedule is always quite tight considering the expanse of cosmos. A casual visit from Sage Narada has never been the case - it was always causal and there was a reason well beyond significance for his visit. The reason is this. Despite their otherwise cozy relationship, Brahma and Saraswathi had just one single bone of contention. It is the same among Gods as among humans. Only the nature of issues differs. It is not uncommon for a husband and wife to quarrel. On earth, a typical quarrel of this nature might, say, last for a just few hours. During these hours – whether it is marriage arranged by elders or self-arranged – it simply does not matter. Each would think that they have been short-changed in the relationship. It would appear as if they have reached the very precipice of relationship; but all that for just a few hours. Then the question of who speaks first to the other arises, after a short spell of uncomfortable silence. There develops an intense desire to patch up, except for the false ego that stands on the way. Well! Biological attraction is far, far stronger than false ego. Generally, the husband would be the first one to yield, “mmm… I have just updated your Android OS. Changed the wall-paper also,” he would mutter. The pinnacle of ecstasy for a man is an impending Android update and that is his trusted way to patch-up with his woman. Google, on its part, keeps dutifully releasing Android updates at roughly the same average frequency as of quarrels between typical married couple, which would be – per stochastic estimates – once every three days. It takes roughly three days for things to settle down, before the next quarrel rears its head. Who would be able to stop ocean waves from hitting the shore? Just as one recedes, you could see a fresh one fast approaching with an even greater vigor. The woman of the house sulks and lovingly utters (there is an utter difference between uttering and muttering; he mutters, she utters), “Wonder when you would get updated! I wish God flashes you with a new over-the-ether (OTE) Operating System every now and then. You always find bugs in me (typical IT…) and it bugs me. I don’t know where my commonsense escaped when I nodded my head and stuck my neck out to you.” For every sentence a man attempts, the woman would have to give back in multiples of five. Yet, there exists an undeniable beauty in such a sulk and the husband inevitably goes down on his knees begging forgiveness for all the faults that ‘both’ might have ever committed.” The woman, as usual, wins; all the while making the man think that he has won! In an argument, a true gentleman should readily apologize for all the mistakes his wife commits. Well... That is typical earth. The same is also the case with heaven – more or less. To err is husband and to forgive is wife! Husband human and wife divine! Brahma had been long since maintaining that Lord Shiva with a serpent garlanding his IBM-deep-blue-throated neck is the primordial God and the most superior. Saraswathi held a position on the contrary – the supine Lord Maha Vishnu on an even larger serpent was the greatest indeed. This contention had been going on for almost a million years. Rivers on earth changed courses; dinosaurs became extinct and meteors landed on Russia (It seems there is no better place on earth for meteors to land). But neither Brahma nor Saraswathi budged – so much for divine ego!! Both felt that the time has now come to arrive at a final, indisputable, undeniable, undebatable, scientific, dharmic and eternal conclusion for this issue, once and for all. But who could be the apt judge? Neither Shiva nor Vishnu could be called to arbitrate, especially when this grave matter concerns them. Saraswathi was not OK calling either Lakshmi or Parvathi. She often quotes George Bernard Shaw, “One woman’s poise is another woman’s poison.” She simply cannot stand these two lovely ladies. An arbitrator should be knowledgeable, just and courageous. Where could such a person be found? Both thought long and hard and decided that Narada would be their unanimous man of choice. It was simply logical and logically simple. After all, Narada has reach across the universe and he is intimate with both Shiva and Vishnu. While the former admired his ‘higher’ virtues, the latter was in no less awe over his ‘highyengaar’ attributes. His demeanor was carpe diem; and well respected here on earth as much as in heavens. A well-balanced person, and more significantly, he is their son. A son never takes positions between his parents and always maintains a studied neutrality. Being an eternal celibate (brahmachari), he has no vested interests either. Narada: Sir, I came here seeking the hand of a suitable girl. Girl: How dare you call me sir? N: My sincere apologies. You are dressed like a man and hence my confusion. G: How dare! What I wear is my fundamental right just as much as not looking at me and closing your eyes is your fundamental right. So, your shoulder size doesn’t look 42. Do you ever go to the gym? G: And what is this ugly outfit you are wearing? Looks stone-age! Ever heard of Levi’s or Wrangler’s? My goodness, your hairstyle! Horrible. And, throw away that dirty musical instrument that hangs on to you like a monkey. Don’t you know to play guitar or drums? Can you ride a motorcycle? I prefer people who look like Shahrukh. I thought at least you would look like Salman, but you look like a salmon. What are your qualifications? N: I am a gnyaani; brahma gnyaani! G: What! I have no clue what you are babbling. So, you are not in IT field! Pathetic. Where exactly do you reside? N: I travel across galaxies. G: You gypsy! I want a James Bond. Not a vagabond. Doesn’t suit me at all. I prefer a US boy with H1 visa who would soon be applying for green card. Do you have your own house or flat? N: Vasudeva kudumbakam. The whole universe is my residence. G: Are you a nut case? Come to the point. What is your CTC? How much is your bank balance? G: You are such a waste! Any inheritance, ancestral properties…? G: By the way, have you identified an old age home for your parents? My parents would be moving with me after marriage. Taking care of parents is important. Yours would be taken care of in an old age home and mine would live with me so that they could take care of the kid. G: No, kid. Only one – if at all. I must focus on my career, which is more important than family. I have the right to protect my rights regardless of what is right. What car do you have? What are your hobbies? N: I don’t have any car. I simply contemplate and devote myself to spiritual practices. G: My foot! Which century BC do you come from man! You don’t even visit bars? Sorry! Totally unacceptable. I prefer those who take me out to restaurants and go on vacations. I am a social drinker and smoke. My friends call me a party animal. My rights! My privileges!! That’s all matter. N: Aren’t those activities against dharma? G: Rustic fool! Don’t act too smart. The man I marry must be totally devoted to me, but also be broadminded if I go out and party with my male friends and colleagues, and come back home well past midnight fully drunk, and sleep for the whole of next day. If a man can drink, why not a woman? I also use expletives to my heart’s content. No one can question my fundamental rights. N: (hitting his own forehead) Vasudeva! Sambo Mahadeva!!! G: Are those brands of Vodka or Whiskey? Never heard of! Can you cook? N (instinctively closes his mouth with his palms): Shiva, Shiva! I was looking for an orthodox partner! G: Fool! May be fifty years ago. Not anymore. Many of us have become right conscious. Even if we suspect someone remotely weakening our rights, we would erupt like volcanoes. Eating non-vegetarian diet is my fundamental right. So, you are a vegetarian! That is why your shoulder size is not 42. G: How dare you talk about my weight! By the way, I always prefer living together and understanding one another before getting married. Narad, marriage is so ancient yaar! I will also not change my gotram and surname after marriage. That way, I can walk-out of a relationship whenever I choose to, in which case I would fully leverage the law to your complete disadvantage. I would also take the help of a few NGOs for this purpose to show myself as a victim, drag your entire family to the street and ruin you. Already your father, Mr. Brahma, has only one or two temples dedicated to him and hence there would be no public support for him as well. G (has the last words): What a village idiot you are! You are not suitable for me in any way! Totally rejected. Get lost! Go to hell. N (muses): Hmmm… I am from the heavens and she asks me to go to hell! How many times I have been there!!! Yama is such a sweet friend of mine. But how could I expect her to understand all these! Girl’s father: Honey, isn’t our daughter God’s gift to the world? How nicely she speaks about her rights! Wow! Girl’s mother: No mango fool! You moron! Quite the contrary; she is our gift to God. Narada decided it would be best for him to remain a celibate to protect his “Brahma Gnyaana”. “Dad, I understand the position that you and mother have taken, as typical; and the need for you to resolve this difference, as justified. But why on earth are people interested in this?” Narada’s tone was grave. 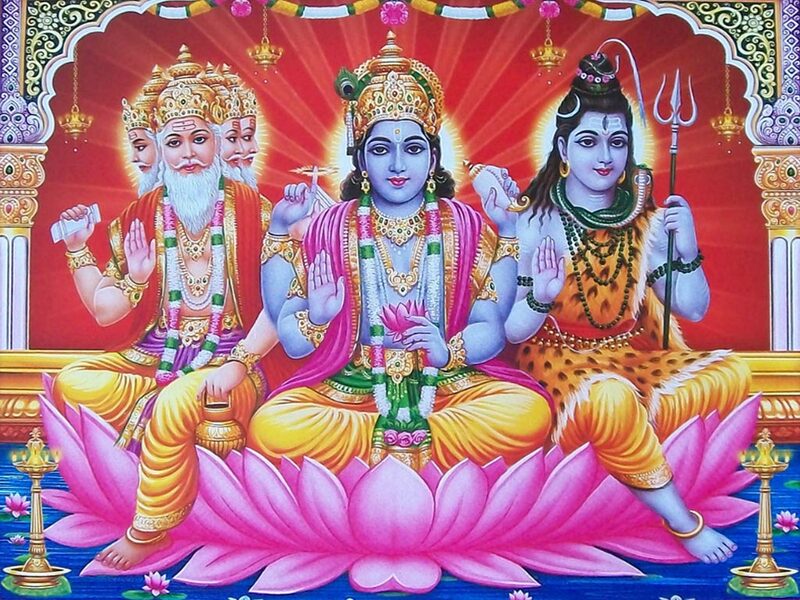 Thus, the world came to know as to who among the two – Lord Vishnu and Lord Shiva – was evidently the greatest. Issue resolved. Go figure! The article has a funny bone to it. It is just a humor. Request you to read it in full. Brahmadhipati Brahmanodhipati Brahma Shivo Me Astu Sadashivoham. Pick your favorite Vishwaroopam Picture of Vishnu. What is it that you see and what is it that you DON'T see? Why do you want yourselves get divided. "BE UNITED" Don't allow gossip by raising these types of arguments which are absolutely immature.